the series includes subs that are designed for compact cars and even motorcycles. Thus this sub is so compact but still with the good bass output. It also stands less than 3.5 inches tall, thus giving you lots of options as far as installation goes. Many reviewers on Amazon.com say they were surprised with the output of this sub. They agree that for a 10-inch sub, this Kicker model performs as if it was a 12 or 15-inch subwoofer. At the heart of this subwoofer is its rigid, injection-molded polypropylene cone. It is designed to withstand resonance even while you crank the bass. It doesn’t flex that easily despite long playing sessions. I also like that it is surrounded by a rubber foam that can last for many years of heavy use. This subwoofer gives you a lot of options as far as wiring it. You can wire its dual voice coils for 4 or 1-ohm total impedance. This gives you more wiring options in setting up your system. As you would expect from a shallow mount subwoofer, this Kicker 10-inch speaker can fit in the tightest of spaces. It has a vent-less and solid pole design which enables it to be fitted directly against the rear wall of a sealed enclosure. It can also be placed under the car seat if you wish. With its shallow mount design, you don’t have to compromise passenger comfort and cargo space at all. This subwoofer can work in both a sealed or vented enclosure. For the sealed enclosure, the manufacturer recommends a minimum volume of 0.4 cubic feet and a maximum enclosure volume of 2 cubic feet. On the other hand, it recommends a minimum enclosure volume of 1.25 cubic feet and maximum of 1.75 cubic feet for this sub, with a 10.5 x 2.5 x 20-inch slot port. 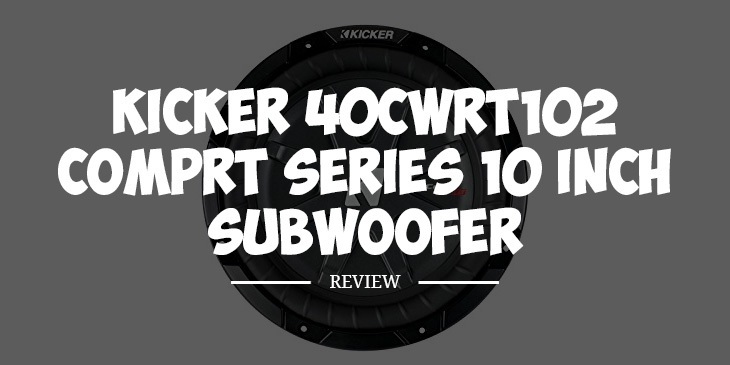 Like all the subs that are part of the CompRT series, this subwoofer has tinsel lead wires. The wires are woven in the spider so that mechanical stress can be avoided. Q. What’s the recommended amp for this? A. You can pair it with any mono amp of at least 400 watts. A. Kicker backs it up with a one year warranty. The kicker is one brand that you can trust when it comes to car audio equipment. This subwoofer is so compact that you can even place this in motorcycle saddlebags. It is a great addition to any compact cars and even sports cars where space is limited. This subwoofer is also very affordable, and installation should be a breeze for motorists who have some experience in setting up their car audio system. In terms of bass output, you can’t really say anything negative about this sub. It hits really hard despite its compact size. I highly recommend this subwoofer.